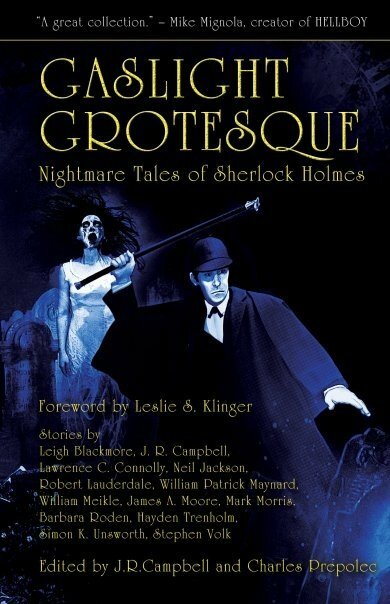 Released in 2009, Gaslight Grotesque: Nightmare Tales of Sherlock Holmes offered a new collection of Holmes stories, each with a horror twist. THE MONSTERS ARE DUE ON BAKER STREET! Between the shadowy realms of fear and the unforgiving glare of science lies a battleground of unspeakable horror. In vile alleyways with blood-slick cobblestones, impenetrable fog, and the wan glow of gaslight, lurk the inhuman denizens of nightmare. Faced with his worst fears, Sherlock Holmes has his faith in the science of observation and deduction shaken to the core in 13 all-new tales of terror from today's modern masters of the macabre!